The American is one of those difficult, against-the-times, auteur-driven films that I suspect many audiences will be disappointed in and which I absolutely loved. First, let’s explain what director Anton Corbijn is doing. He has created a slow paced, romantic film about a sensitive assassin (a character of possibly military past who has developed sufficient tricks for staying alive so far, but has stayed too long in the business; not too dissimilar from Fred Zinneman’s Jackal). Using wide framing shots of the Norwegian and Italian landscapes, as well as techniques of Italian cinema (off-center camera, distanced point of view, loving scenes of Clooney’s daily morning gymnastics), Corbijn evokes the feeling of a bygone era. There are no slam cuts in this movie, no pounding techno soundtrack, no overly hip dialogue or sound effects to distract and bombard the viewer. This makes it seem like a film from another age. At the same time, it makes me remember what movie-goers use to love about cinema: the ability of the camera to take you deeply into a simple story. The set-up is basically that of a Western. Clooney’s character, Jack, comes to town (Castle del Monte – Castle on the Hill – which is a quaint Italian Tuscan town that is literally a fortress). He’s being chased by unknown assassins (“the Swedes”) and has been asked by his handler to perform one last job. The job turns out to be building a weapon (which he’s supremely good at doing) for a beautiful female hit-woman to use on some big hit, while he lays low in this anonymous town. We see the locals practically scatter behind the doorframes and shutters as Jack rolls in: they smell trouble. Jack has been told to not make any friends (lest he get them – or himself – killed), but he immediately ignores that advice and makes two essential ones: the local priest, who becomes Jack's confessor, and Clara, a beautiful prostitute who finds herself falling for Clooney’s silent-but-deadly type. Corbijn wants to keep the movie as Zen-like and spare as possible, and so we get no information about who the intended target of the assassination might be or even very clear revelations about who wants him dead (though there are clearly some implications). This – like the slow pacing and loving shots of Italian scenery – is likely to displease some movie-goers who are used to finding their assassin movies delivering esoteric but digestible answers about brainwashing, the CIA, Arab terrorists, or some such pleasing conspiracy. The American traffics in none of that and some people may find that leaves the movie uncomfortably empty. I found it a refreshing relief and something of a rare treat. Think of this as Italian cinema borrowing Western tropes starring an American actor. It must have been a thrill for Corbijn to recreate the Sergio Leone style in his homeland and that pure enjoyment in film making is contagious for those who appreciate these things. Corbijn does have to supply and ending of some sort and the one he comes up with is impossibly romantic (there’s a metaphor of the butterfly – Jack’s nickname, in fact – which is the one heavy-handed gesture, used like a splash of bright color in an otherwise drab painting). 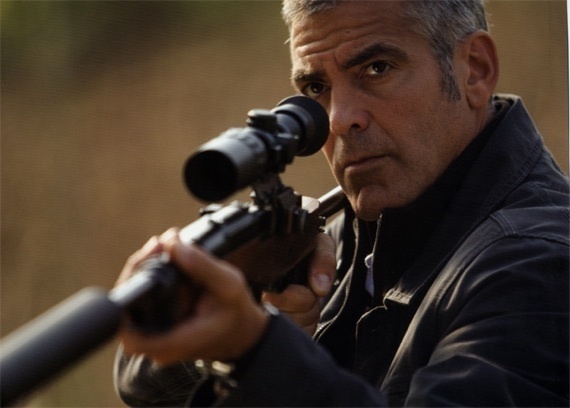 As Clooney creates his gun for the female assassin, we see how the two are naturally suited for each other – there’s a lovely dialogue in a meadow where the two pretend to have a picnic, and she asks Jack to shoot the gun at her so she can assess the craft behind the silencer (and only the most naïve moviegoer could miss the metaphor). But ah, such love is not meant to be, and Jack instead must place his affections, and hope for salvation, in the hands of the blank but pretty prostitute. One senses that there is a cycle here (in fact, this is about the point of the relationship where we first entered the movie, with a different…one assumes…prostitute, and that relationship didn’t end well), but this time, Jack is determined to change his fate, and that of his lover. It’s no coincidence that Jack has chosen to befriend a Priest, another “sinner” who seems to be able to speak a simple truth that has so far eluded him. That truth, a traditional Catholic idea of confession and forgiveness illustrated in an unconventional context, drives Jack’s ultimate decision to change his fate. Jack’s decision to embrace what’s essentially a romantic image of salvation seems – well, a bit contrived – but is forgivable, given all that Corbijn has done throughout the movie to earn his ending sentiment. The American is actually fully Italian, then: beautiful, deliberate, spare, symbolic, Catholic, overly sentimental. And a throwback to the great Italian Neorealismo of the Sixties.